I don’t race as often as many runners I know, so I feel a lot of pressure to make it count when I do. If I’m not going to race a certain distance again for another year, I need that PR. Last year I won a 4-year battle with the Monument Avenue 10-K to break 50 minutes, finishing in 49 minutes flat. (You can read that race recap here.) The race is set for March 29 this year, and while I will be content to shave even seconds off my time, I’ve set a goal to run it in 48 minutes. 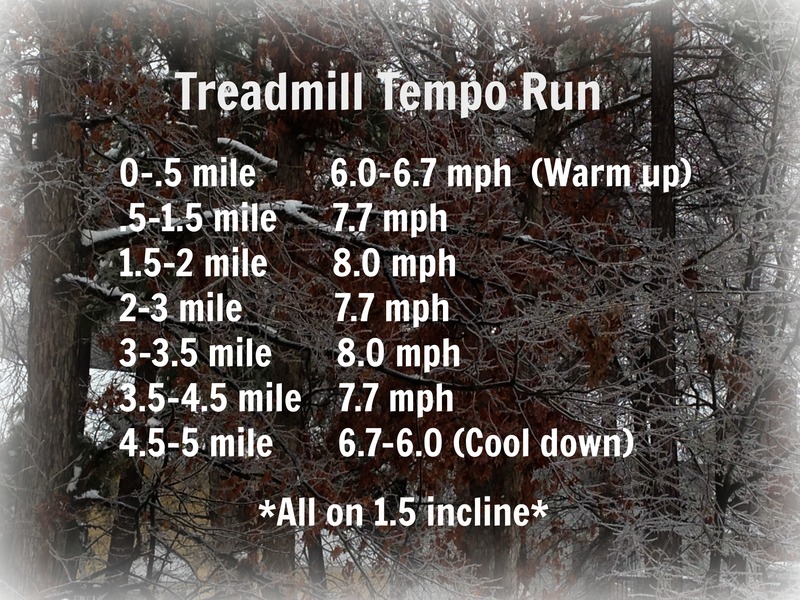 Is it still a tempo run if you don’t run one pace the entire time? I like adding in a couple of half-mile faster spurts to avoid getting bored–plus, 7.7 mph feels easy when you’re coming down from 8.0 mph. 😉 It was a great workout, regardless. I am pumped about the race and training and all that it entails! After work today I am heading to a local high school track to do some 400 m repeats…wish me luck! -What are you training for right now? –How may speed workouts do you do each week? This entry was posted in Fitness and tagged fitness, health, running, training by Catherine @ A Two Storey Home. Bookmark the permalink. Great job! Tempo runs are really great! I’m training for Shamrock Half Marathon mid March and I do one speed workout (meaning track workout) a week. I also incorporate some speed work (not on the track) in (some) of my everyday workouts. Good luck on your speed workout today! Wow, this is great! I never do speed runs haha. I just run. What a great previous time, and you’ve totally got this new PR under your belt with this training!